According to market analysis firm Canalys, Apple still leads in overall tablet sales, moving 14.6 million units last quarter. That total amounts to 42.7 percent of the 34.2 million tablets shipped overall in the quarter, down significantly from the 71.2 percent share Apple held for the same quarter last year. Meanwhile, Apple's chief rival Samsung shipped 7.37 million tablets, or 21.6 percent of worldwide shipments, several times more than it did for the same quarter last year. Amazon, which runs a forked version of Android on its Kindle Fire devices, came in third place with 4.5 percent of shipments, followed by Lenovo and Acer at 4.3 apiece. 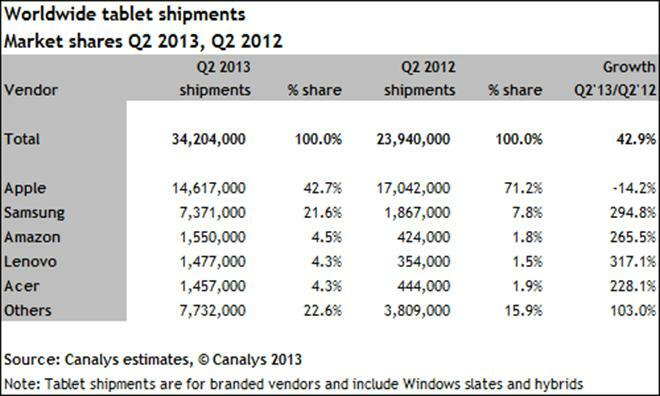 The four largest Android and Android-derived vendors, then, account for just over one-third of the total tablet market. The remainder of the market is taken up by the 7.7 million tablets shipped by "Other" manufacturers, or 22.6 percent of the market. While Apple lost share, the other manufacturers listed all saw their shares grow year-over-year. Canalys' study attributes this to the tablet market truly coming into its own. "Tablets are now mainstream products and hardware innovation is increasingly difficult," said Canalys analyst James Wang. "With branded Android tablets available for less than $150, the PC market has never been so good for consumers, who are voting with their wallets." Apple executives have long expressed the importance of the tablet in the company's plans going forward. CEO Tim Cook said earlier this year that the tablet represented "the mother of all markets" and that Apple would pursue it aggressively. Cook has also cast doubt on whether buyers of non-Apple tablets are getting as much use out of their devices. With the latest figures showing the iPad holding 84 percent usage share according to some measures, it would appear that owners of other tablets are not using them as often as are iPad owners. Still, even as Apple's share of shipments slips overall, Canalys' report predicts that the Cupertino company will retain a considerable lead in profitability. Apple will "remain [the tablet market's] most profitable vendor for years to come," according to the report. The increasing competition, though, could see Apple introducing a lower-cost iPad in the near future in order to stave rivals. Such a device has already been predicted by some observers, who say a low-cost iPad mini could debut some time next year.